Home > Catores Specials > Give a day in the mountains as a present! The new and most original way to give strong emotions on the Dolomites. 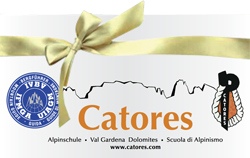 Request the coupon for a climb, a ferrata or a winter ski tour with a Catores Alpine Guide. Available at the Catores Alpine School.